Auberge Etchegorry – Overworked. Underfed. Etchegorry is quaint little local restaurant specializing in Basque cuisine. Mama H.o.P’s Parisian friend, who I guess I’ll call Parisian Friend, has been a patron of this restaurant for years and years and she had nothing but high praise for this place. The restaurant itself felt pretty homey, no frills. I can’t say our welcome was as warm. I think we sat at our table for a good 10 minutes before anybody decided to give us menus or drinks. It’s not like the place was busy. We were the first ones to show up for our reservations. Slowly the restaurant become packed. Parisian Friend says it is always like that, and you have to have a reservation or it’s a no go. This is probably the cleanest tasting foie gras I’ve had. It’s not that I mind the livery-ness of foie, but the smooth buttery light offal taste to this very notable. 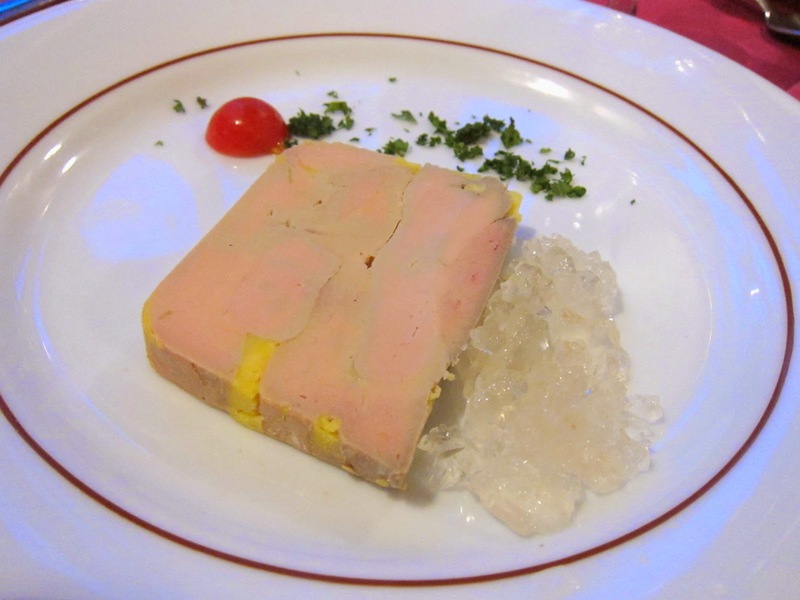 Jurançon is a type of wine which lightly scented the foie adding to delicate fragrance. And of course, they never serve enough house toast to eat with with foie. Why is it like that everywhere?? Everyone else seemed to be enjoying this as their starter. Parisian Friend highly recommended it. It was pretty darn complete with some foie, smoked duck breast, smoked salmon, melon, and green beans. I think it would have been better without the smoked salmon, but overall it was very fulfilling salad. Duck filet pan roasted with honey and potatoes cooked in duck fat was another popular dish ordered by many other diners that night. I thought the sauce was a bit too sweet, but maybe that’s just me. 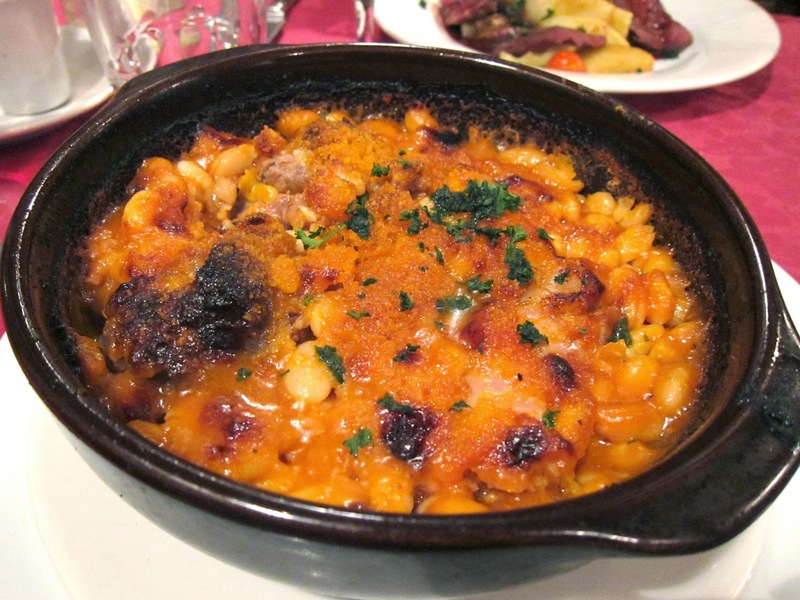 I’ve never eaten cassoulet before. I think I first heard about it from an episode of No Reservations when Anthony Bourdain makes this dish for a family he is staying with and it didn’t seem to go over well with the kids. Parisian Friend warned me against the tiresome taste and heaviness of all the beans. It did get a bit boring, but the taste was so flavorful. A lot of umami-ness in here. Between the sausage, duck leg, and lamb shoulder, the latter was definitely my favorite. It wasn’t too gamey. I was pretty full but kept nibbling at this bit by bit. It was pretty much gone by the end. The cassoulet could have been a bit moister but maybe this is how cassoulets are? Not sure what this translates to exactly but it was apple tart-esque. 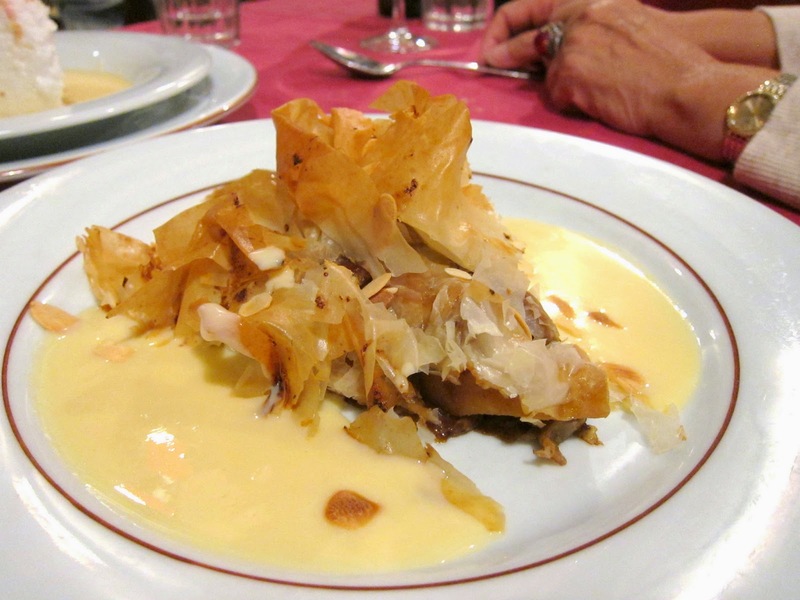 Phyllo dough was used instead of a more traditional flakey pastry dough. 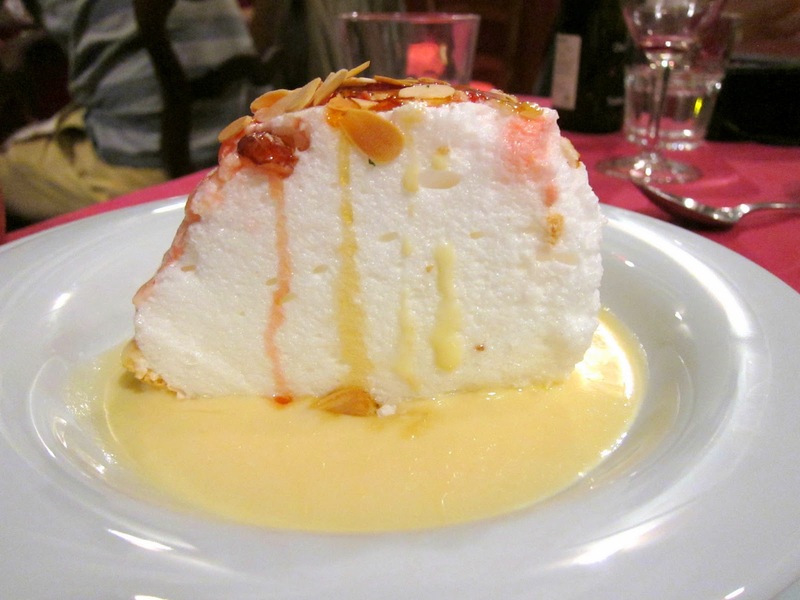 It was complemented by a lightly sweet creme anglaise flavored with Armagnac, which is a type of brandy. A “floating island” of meringue sat atop some more creme anglaise. Toasted pralines gave some crunch and texture. I’m not a huge fan of meringue but Parisian Friend went to town. It is NO secret she LOVES sweets, even more than me! 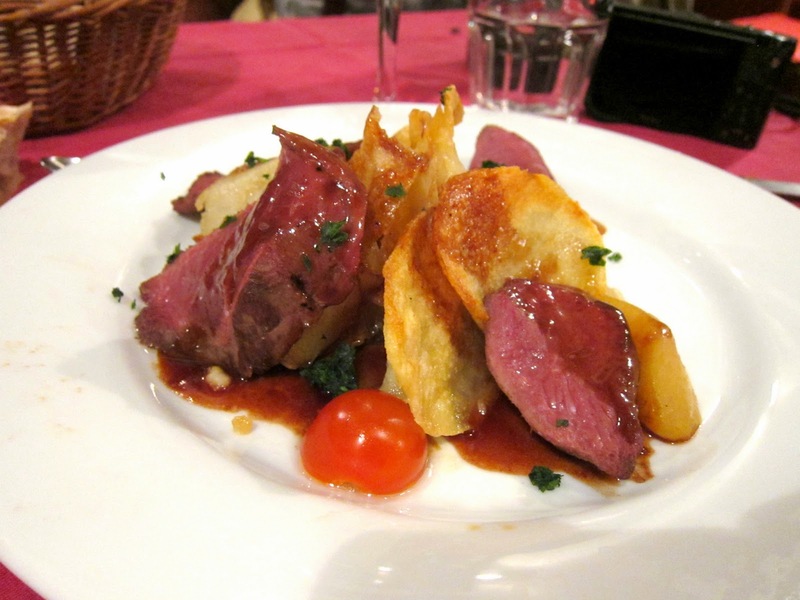 Etchegorry was a welcome change from the French cuisine that I’ve become familiar with. I appreciated the rustic quality. 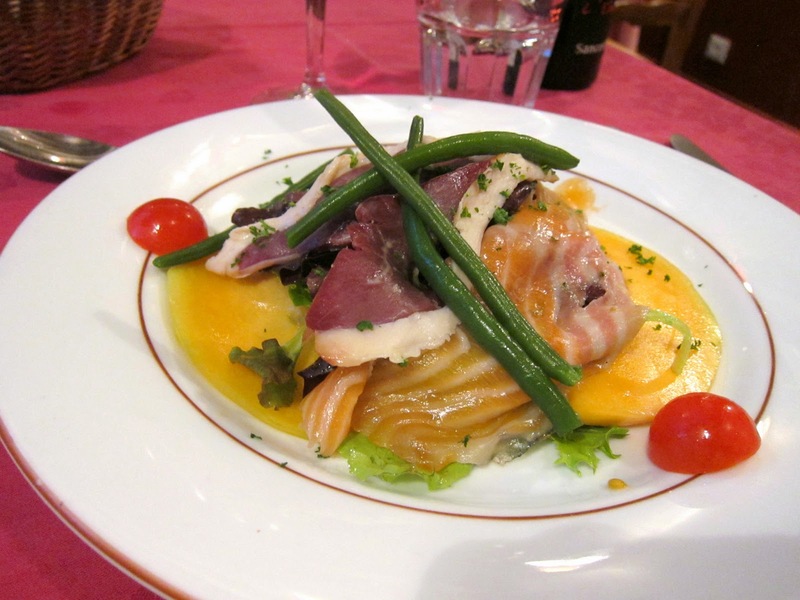 It was a reminder that all French food isn’t all hoity toity. Aside from the slow attention at the start, the rest of the service was fine. It also wasn’t too pricey at all too. We met the chef, who seemed very kind and happily took a picture with us.